10.09.2005 - This is the most awesome animal that I've ever caught in my career as a wildlife removal specialist. It's a 7 foot Eastern Diamondback Rattlesnake. This species of snake is the deadliest in North America, and this is one of the largest specimens. No documented cases of an 8-footer have been verified, but that is probably the maximum length. Every now and then a 7-footer turns up, but it's rare that they reach 6 feet. This monster was huge and fat and in perfect shape, with 12 rattles on its tail. I get many phone calls about rattlesnakes. 99% are false reports. Many people are ignorant about snakes, and unaware that many species rattle their tails when threatened, even harmless snakes. And more than that, some people see any snake and simply assume it's a killer. So when the lady on the phone told me that she thought she had a rattlesnake in her yard, I said, "sure, sure... I'll tell you what. I'll come for the snake, and if it really is a rattlesnake, I'll remove it for free. If it turns out that it's not a rattlesnake, my $129 snake removal fee will apply". She said that she could not afford the fee, and I continued my drive to my next critter job. But then she called back, and said, "I REALLY think it's a rattlesnake". I asked her to describe it, and she said, "Well, it's maybe six feet long, and tan with dark diamond shapes on its back and a fat head and it has its tail up and it's rattling very loudly". Now THAT, ladies and gentlemen, is a description of an Eastern Diamondback. I said I'd be right over. I arrived at the house and parked my truck, and even from the street I could hear it rattling in the back yard. The homeowners pointed at the snake from a distance, not that I needed their help, and there lay a massive rattlesnake, coiled up near a chain link fence, and in a defensive posture. I VERY carefully guided the snake, with a snake hook, into a an extendable snake sack. I knew that this snake could strike from up to four or more feet away, at lightning speed and perfect accuracy, and could even sense my heat, like all pit vipers, and strike through the snake bag without seeing me with its eyes. It was so heavy that I struggled to transport it while held away from my body, but I safely got it in the truck and locked away, and of course left with no money. I caught this snake right in Orlando, in a residential neighborhood. The one difference about this place was that it was right on the edge of a very large undeveloped area of forest. These snakes breed in autumn, and I suspect that it came out of the forest area, and wandered into the yard. It was too big to fit through a chain link fence once inside, so after it came from the front of the house into the back yard, it got stuck. I brought it home and observed it and photographed it for a day. Some animals are creatures of myth and lore, and have fierce reputations, but then when you actually meet the animal up close and personal, it's not all that impressive. But this snake went above and beyond in terms of raw ferocity. I had this snake in a giant cardboard box in my house, and I was working in the kitchen, when it sounded like a bomb had gone off. I jumped back, thinking that the stove had exploded or something, and then realized that the sound was coming from the snake. Its rattle was that loud! Any time I dealt with it via the snake hook it was just so heavy and powerful. I blew up some balloons for it to strike, and the speed of the strike was astonishing. I read that the strike of this species is 175 m.p.h. The fangs on this beast would have been close to an inch, if I could have politely asked it to say "aaaah" and let me measure them. I had to be extremely careful with this snake. At one point, as it lay on the ground, I passed by at about five feet away. It struck, made it to within 6 inches of my ankle, and was back to original position before I could even blink. It was that fast. This snake is extremely deadly. Most of the deaths due to snakebite in North America are due to this one species, the Eastern Diamondback. It lives only in Florida and the southern parts of Georgia, Alabama, Mississippi, and Southern South Carolina. There are 14 species of rattlesnake in North America, and other venomous snakes such as the Copperhead, Cottonmouth, Sidewinder, Coral Snake and such, but none are nearly as deadly as the Eastern Diamondback. The Western Diamondback is similar, but it's smaller and injects less volume and potency of venom. 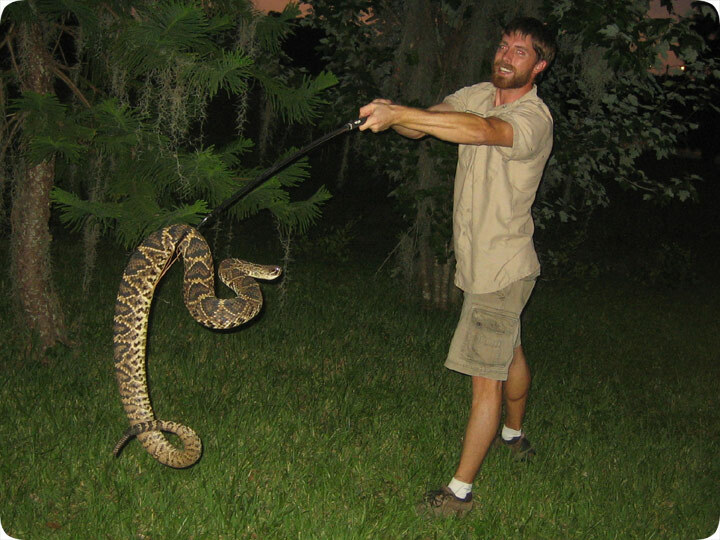 A snake of this size could deliver almost 1000mg venom in a bite. Death from this snake would occur very rapidly, perhaps in as little as an hour, as the cytotoxic venom destroys internal body tissue - all of it, from the heart to the brain. Some people bitten report a metallic taste in the mouth, and most such people do not survive. The fatality rate from a bite from this snake would be extremely high. It's true that many bites are "dry bites", meaning no venom injected. But a venomous hit from this snake that I'm holding would kill anyone for sure. Two weeks after I caught this snake, I read a report about an incident with an Eastern Diamondback that occurred two counties north of me. Some homeowners found a 5 foot Eastern Diamondback on their property and called the fire department. A fireman came out, saw the snake, and shot it several times with his pistol. The snake then lay still and limp, and he picked it up to dispose of it. Instantly the snake swung around and bit him in the hand. He was rushed to the hospital and received 17 vials of antivenin! Yet he still died. I have a lot to say about this. First of all, people who are not experienced with snakes should not handle them in any circumstances. The same goes for all wildlife! Why people think that they can handle wildlife problems on their own is beyond me. Everyone is an expert. Police, firemen, and general do-it-yourselfers are not equipped to deal with wildlife! I've seen countless costly mistakes, for both people and animals. The fireman didn't know that a snake has motor reflexes that remain in place even after death. He probably didn't know that even if he had managed to put it in a sack, that it could have sensed his heat through the material and still bitten him, right through the sack - I've heard of that happening as well. In addition, I think it's a terrible shame that snakes are persecuted because of ignorance and fear. ALMOST ALL CASES OF SNAKEBITE OCCUR WHEN PEOPLE ATTEMPT TO CATCH OR KILL SNAKES. It happens again and again and again, and people never learn. Just leave the snake alone, and it will not harm you. Had the homeowners simply left that snake be, it would have left the premises, and everyone would have been fine. Of course I feel bad about the death of a person. It's a terrible thing. But it could have been prevented if people would simply bother to learn just a little bit about the living world around them, instead of treating it like a place to pave over. Just a little respect for the wild animals of this earth other than homo sapiens would make this place a whole lot better. The snake in the above photo is a rare and magnificent animal. It's nearly a miracle that it survived for the 15 or so years that it took to reach this size. I am of course proud to say that I relocated it to a suitable habitat far from any people, and I hope it thrives. It's a marvel of natural engineering, and an amazing animal. People are scared of monsters, and as a result, magnificent species are slaughtered, while people happily ignore the true killers all around us, and that's too bad.